TEMO sunrooms have extruded aluminum frames that are built to withstand harsh weather conditions year after year. Plus, they have an extremely sturdy TEMKOR surfacing that prevents dents, scratches, and other damage while making them easy to maintain. With a TEMO sunroom installed at your home, it will be like bringing the outdoors in. Thanks to high-performance thermal wall and roofing systems, you’re sunroom will be exceptionally resistant to heat transfer, making it easy to keep the space comfortable throughout the year. TEMO sunrooms are designed to be flooded with natural light and provide beautiful views of the outdoors. Plus, you’ll get to select from a wide range of styles to suit your unique tastes and needs. Solarium, cathedral, studio, and conservatory are just a few of the style options you’ll have. What’s more, when you have a TEMO sunroom installed at your home in Hardeeville, SC, you can rest easy knowing you’ve made a sound investment. In addition to the lifetime transferable warranty that comes with all TEMO sunrooms, Porch Outfitters will provide our own lifetime workmanship warranty. 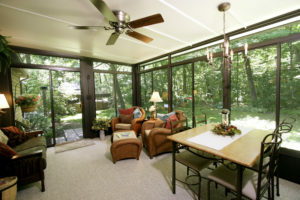 Learn more about our sunroom options by contacting us today.